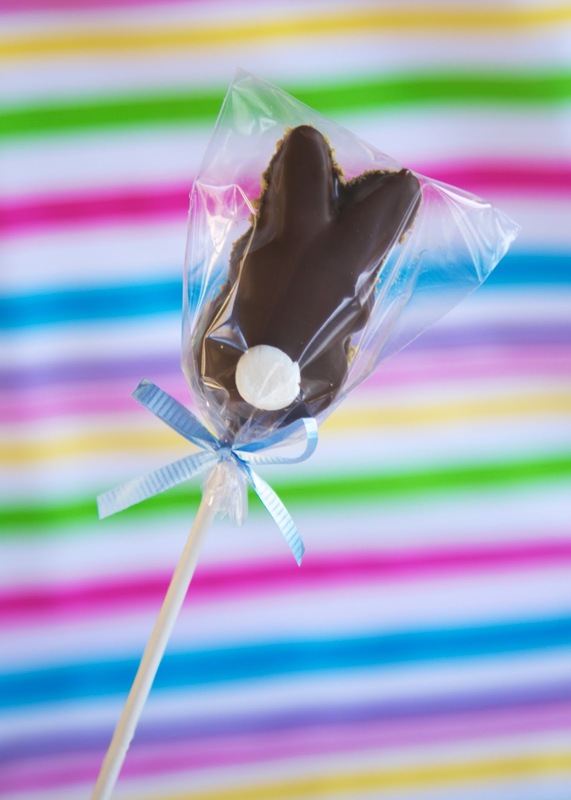 Bunny Peeps S'mores Pops - seriously adorable no-bake Easter treat!! 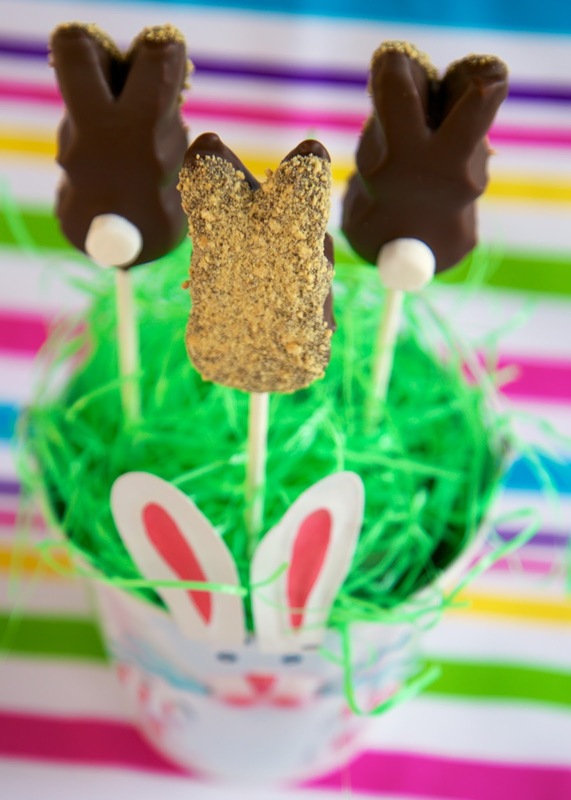 Bunny Peeps dipped in chocolate and rolled in graham cracker crumbs. Such a festive holiday treat! Aren't these Bunny Pops adorable? !They are made with Bunny Peeps. These are very easy to make; simply dip the Peeps into some melted almond bark, graham cracker crumbs and pop a marshmallow tail on them. I used small marshmallows for the tail. I cut them in half so they wouldn't stick out a lot. I used 8-inch lollipop sticks, Wilton treat bags, and pastel curling ribbon. I thought they looked great. They tasted even better! 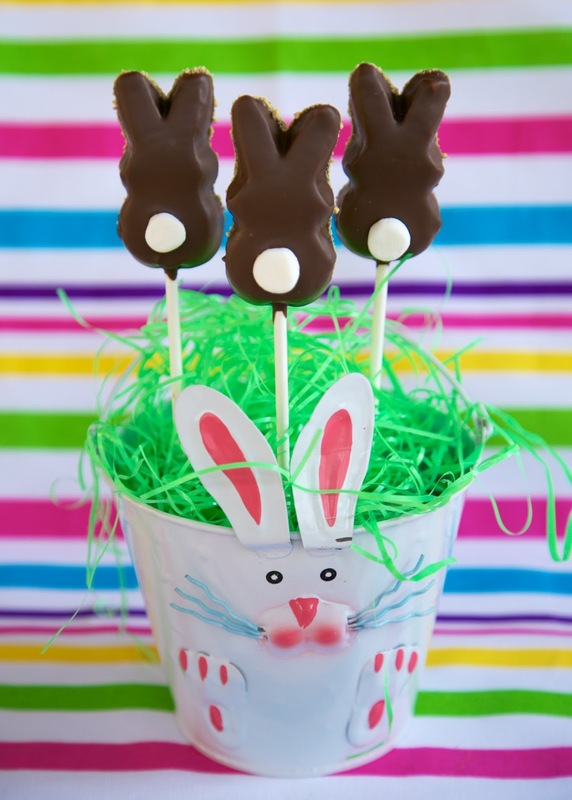 Make as many or as few Bunny S'mores Pops as you want/need. I suggest making more than you think you need. These pops are crazy addictive. Chicken Legs loved these. He couldn't walk past them without eating one. This is a great Easter activity for the kids! Easter is right around the corner. Get hopping! Insert lollipop stick halfway into the Peeps. Cut mini marshmallows in half. Set aside. Melt almond bark/candy coating according to package directions. Dip Peep into candy coating, roll around to coat. Shake off excess. Immediately dip one side of the coated marshmallow into graham cracker crumbs (or sprinkles). Place coated peeps, graham cracker side down, on parchment or wax paper and place marshmallow on peep. Allow to set up and them place clear treat bag over Peep and tie with curling ribbon. Love these!!! These would be great gifts for my employees. You mentioned sprinkles in the ingredient list...but don't see any on the peeps...is that an option to the graham cracker crumbs? Love all the peep treats right now! These are so cute and would be perfect for treating some special people too!